Everyone enjoys celebrating love on February 14th. Telling people that you care for them warms your heart and soul ... much like a good cup of tea. So, please make yourself at home and join me this Valentine's Day. 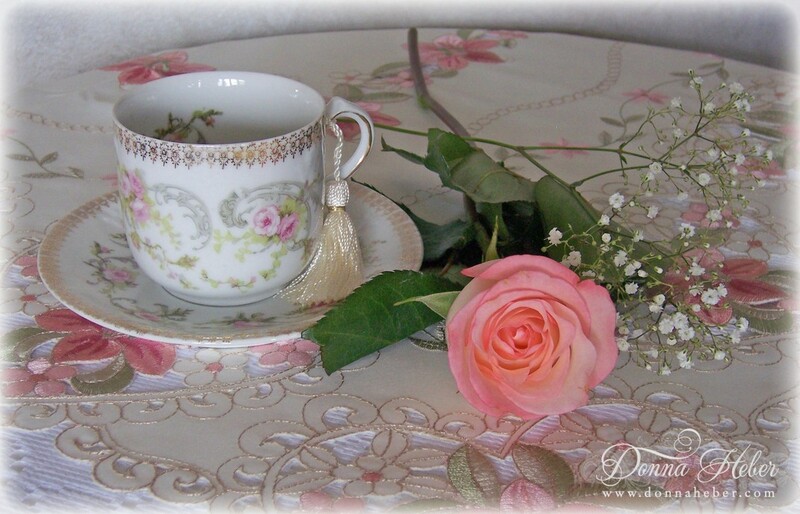 Today I am sharing with you a Zeh, Scherzer & Co. teacup and saucer in the Mignon pattern. Isn't the delicate gold detailing just gorgeous and perfect for Valentine's Day? The teacup is 2.75" tall and 3" in diameter. The bottom is clearly marked "Mignon" Z S & Co. Bavaria. A pink heart shaped dish in a whitewashed basket brings a charming Valentine's touch to the table, and is a sweet setting for our petite cheesecakes. "Love is the master key that opens the gate of happiness." 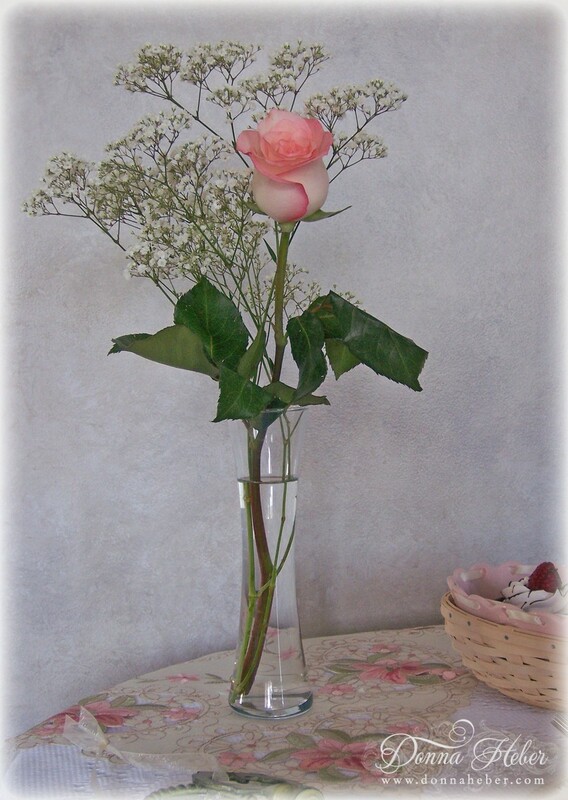 Whose heart isn't melted by a beautiful rose with a velvety texture and a heavenly fragrance. Do you really know the historical meaning of Valentine's Day? Saint Valentine was a bishop who held secret marriage ceremonies in Roman times when marriage was prohibited for young men and was executed by the latter. When Valentine was exposed for performing secret ceremonies he was jailed and given the name "the friend of lovers". While in prison Valentine's jailer, Asterius, brought his blind daughter into see Valentine hoping he could heal her blindness, and according to historical findings, he did. Meanwhile, a deep friendship had been formed between Valentine and Asterius' daughter. It caused great grief to the young girl to hear of her friend's imminent death. It is said that just before his execution, Valentine asked for a pen and paper from his jailor, and signed a farewell message to her "From Your Valentine", a phrase that lived ever after. Thank you for having tea with me on this special day! Whether you are sharing the day with a sweetheart, family or friends love is in the air. Please do indulge in a treat as I enjoy tea with these lovely ladies. 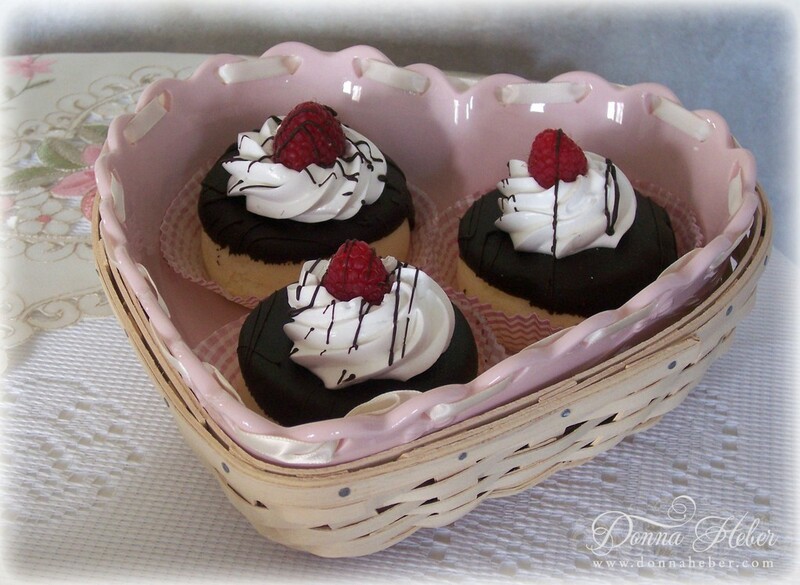 this looks very elegant and delicious donna. Thanks for looking at my tin teaset and I have really enjoyed looking at your delightful cup and saucer. What a pretty tea set! This is a lovely post. What a sweet cup and rose! Beautiful tea Donna! I didn't know that about the history of Valentine's. Wonderful post! Have a wonderful Valentine's Day! Beautiful post Donna. I liked reading the story of Saint Valentine. So sad and romantic. Thank you for sharing. Happy Valentines Day. That is such a dainty teacup (very pretty) and the little cheesecakes look delicious. Thanks for sharing the story of Saint Valentine. 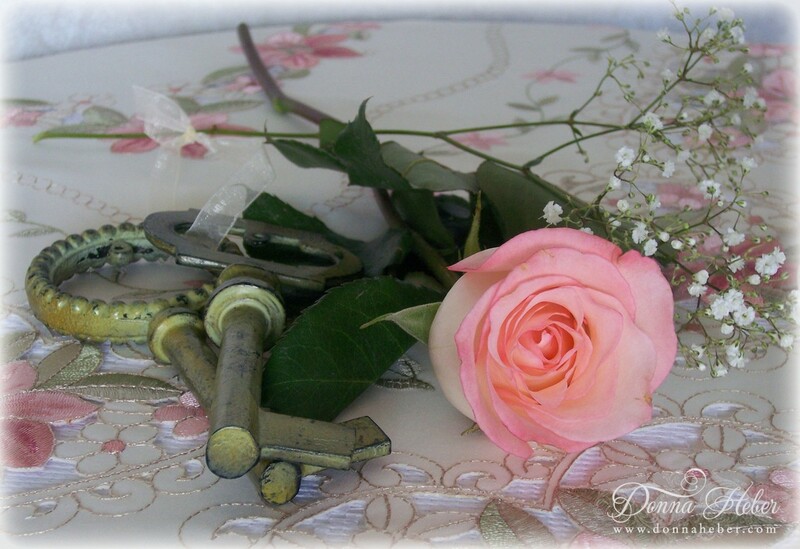 A lovely Valentine setting. 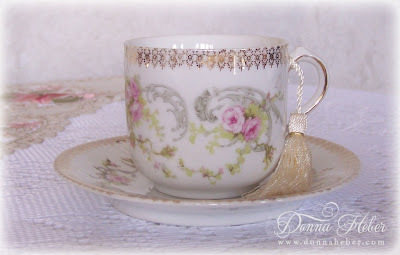 I love the teacup...so elegant and deliscate a pattern. Happy Valentine's Day! I didn't see your email address to reply, but hope you will check back. 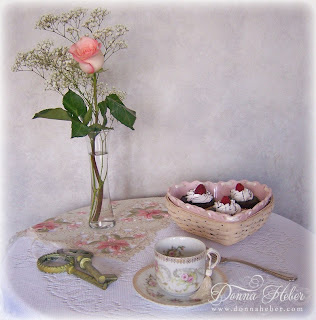 Yes, all the teacups and teapots you see on my blog are my own and all photography is done by me. If you would like to come over and assist me I could use the help :-) Also, all flower and garden pictures are from my gardens. You will see my watermark on the pictures. Happy Valentine's Day! Hello Donna! Happy Valentine's Day! Your tea cup is just gorgeous! Your vignette is beautiful! I hope your day is full of sweet love! Absolutely lovely! That little demitasse is beautiful :) Happy Valentines Day! This is my first visit to your wonderful blog! That is a beautiful cup and I love that rose, sogorgeous. i adore your teacup and saucer, they're so beautiful! 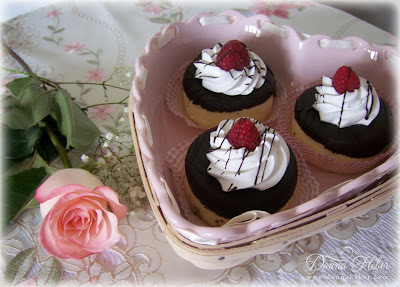 and those cheesecakes look so delicious and cute! lovely photos and wishing you a Happy Valentine's day! Your little teacup is darling and a real treasure! Your cheesecakes look delectable sitting in the pretty dish. Thank you for joining me for tea today and Happy Valentines Day! I've just become your newest follower, #145, my name is Donna, too. You blog is simply stunning! I will be listing your blog on my favorite blogs as I want to stop by often and learn more about your blog and you. I will also be adding your blog button to my side bar! Your table is beautifully set and I love the large keys. It so goes to the theme of "keys to my heart." Your teacup is divine! It looks so delicate to be so large. But it is perfect for those yummy cheesecakes. I love the story of St. Valentine. A man of compassion and love. Hope your Valentine's Day was perfect. What a wonderful blog design. Your post photos are so romantic. 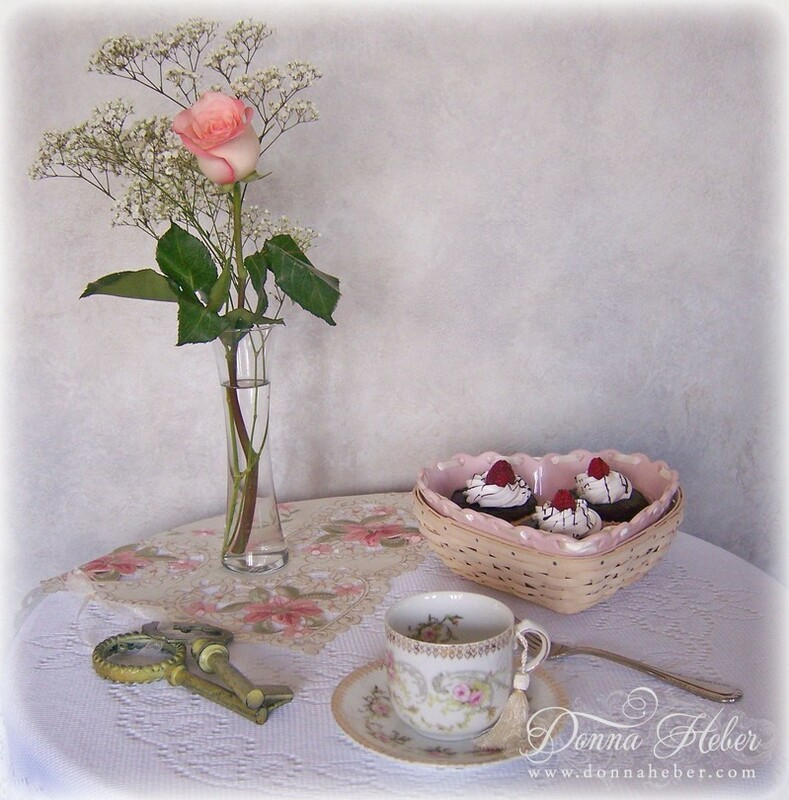 Love the teacup/rose/valentine treats presentations. Hello Donna, Love your beautiful photos! They keys are marvelous as is the quote! Simply enchanting! Oh such a sad story! Imagine that! Your post is lovely. Your new blog design is fabulous! I hope you had a really lovely Valentine's Day. I am following your blog. I love the china and I think I am going to collect heart shaped dishes. I am not into Valentines Day but love hearts. I have collected heart shaped glass boxes but did not think about dishes. Thanks for inspiration. What a lovely post you have made here! Thanks for linking to Friends Sharing Tea! What a beautiful share today. I love heart shaped dishes, and yours is so beautiful. Your teacup is precious as well. Thank you for the beautiful share today. Beautiful setting and what a neat story.